These are the most commonly sold species of frogs that can live their entire lives submerged in an aquarium. While they do come to the surface to gulp air quite often, they do not leave the water. Most frogs need to be able to get out of the water (to hunt, to breathe, to find mates) but these frogs do not. 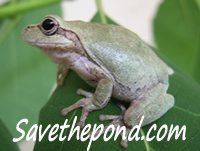 For information on common frogs found in the Eastern USA, see this frog page. I do not cover frogs or toads commonly kept in terrariums like White's tree frogs, Pac Man frogs, African horned frogs, fire toads, etc. See the links section for lots of links to sites that do cover these frogs extensively. There is an excellent article entitled "Underwater Frogs: An Overview" in the March 2002 issue of Aquarium Fish Magazine on Pages 46-53. It has a lot of good information including breeding information. Due to lack of time and not wanting to be guilty of plagiarism, I have not copied any of the information to this page. You can visit Aquarium Fish Magazine to see about getting a copy of this back issue. One person asked about salt and ADF's. Some people say to avoid salt entirely but I used about a tablespoon of aquarium salt per 5 gallons, and my ADF's were fine. Frogs are more sensitive to salt than some fish, perhaps as sensitive as some of the scaleless fish. That means, you do not want a lot of salt but some is okay. I would not put in more than a tablespoon per 4 gallons or so. If you do not have fish with the ADF's, do not use any salt. It is not needed for the frogs. I use it to help the fish in with them as my water is super soft and low in anions, cations, and minerals. The salt helps with the osmotic regulation of cations for the fish (sorry, I am a chemist!) and reduces the stress on the fish. This information on salt probably holds true for all other amphibians as well! A little is fine; a lot is bad. Too much salt will make water try to leave the frog and can leave him without enough water inside the body despite being surrounded by water. I also use low levels of salt in my ponds which have green frogs, bullfrogs, and other frogs in them. No problems have arisen. For more information on salt, go to the salt page. I have found two commercial aquatic frog pellets. I do not know if my frogs ever even ate them as they were so happy with the daily live blackworms and freeze-dried insect larvae and worms. One brand is HBH Frog and Tadpole Bites. The first three ingredients are anchovy, krill, and squid. My local store sells it. I do not know of mail order sources but check out HBH's web site for more information. The other food is called Jurassi Diet Newt and Aquatic Frog Food. The first three ingredients are krill, fish, and alfalfa. It contains larger balls, and I think they are less appealing to the frogs. More information may be found at the Jurassi Pet web site. Two places that sold these pellets were That Pet Place and Drs. Foster and Smith but they may no longer do so. Drs. Foster and Smith also now has "Frog and Newt Medley" as shown below. Drs. Foster & Smith deleted their affiliate program so these links will no longer work. I am leaving up the pictures which are still working for now. Aquarium frogs are generally pretty healthy. When they do die, there is often no sign of anything wrong. Like all amphibians, ADF's and ACF's shed their skin as they grow, more often when young and maybe once a month when grown. Like most amphibians and reptiles, this is normal, and they often eat the skin although I have seen many empty "skins" in my tank. Presumably, eating the skin returns some nutrients to the frog. Perhaps they also like to clean up and reduce signs of their existence to avoid attracting predators. Prior to shedding, the frog may appear whitish. If this passes after shedding, there is no problem. If the whitishness remains, the frog may be ill from a bacterial or fungal infection. Aquatic frogs often lose pieces of limbs here and there, perhaps from other frogs. Usually, they recover but sometimes fungus sets in. It may also occur in really dirty tanks or with other physical injuries. I am not sure if fish fungal medications would be prudent as the toxins may be worse for the frogs than the fungus. Instead, try treating with aquarium salt at a tablespoon per 3 to 5 gallons. Frogs generally do not like a lot of salt but neither do funguses. At these levels, the frogs will not be harmed but perhaps the fungus will be reduced. Aquatic frogs may appear fat for a number of reasons including just eating too much or being a female with eggs but sometimes they get bloat. Bloat is probably caused by an internal bacterial infection which messes with frogs ability to drain excess fluids (mostly water) from its body. So, it gets larger and larger, full of fluid. Treatment is to use aquarium salt at about a tablespoon per 5 gallons, to use Epsom salt, or to try aquarium fish antibiotics. A frog with bloat will literally look like it is ready to explode. There are two photos under my African dwarf frogs of one that I had with bad bloat. These links were last checked on 6/30/10. Her pIndex - links to three web pages on African clawed frogs and one on African dwarf frogs. This is an archived version of the site which is now gone. Frogland - includes an internal link to a FAQ on African Clawed Frogs and internal links to dwarf frog information and telling clawed frogs from dwarf frogs. If the previous link does not work, try this one. Patrick Timlin's Aquaria Page - links to five or more African clawed frog web sites. This is an archived version of the site because it no longer exists. Mike Edwardes' Dwarf Frog Page - this page has general information and some good information on feeding and breeding African dwarf frogs. The site is gone so this is an archived version of the site. T he World of Webby the Frog - site on African dwarf frogs. This is an archived version as the site no longer exists. Africa n Dwarf Frogs - a nice site on these guys. This is an archived version of the site which no longer exists. African Clawed Frogs - a lover of clawed frogs sharing information, includes free e-mail newsletter. They are also doing a survey of ACF owners. Below is the banner for Fluffy's Frog Pond, a site on African clawed frogs that has disappeared like most of the sites on this page! Aquatic Foods - sell live blackworms, great to feed your frogs if you cannot find them locally. Frog Video - it is supposed to show an African dwarf frog eating a minnow. I cannot get the video to work (do not have the software) but Paul let me know on 11/17/07 that it was in fact an African clawed frog as I suspected.